If you are like me, you have grown accustomed to seeing a detox as a physical experience. A way to remove all the impurities swallowed, inhaled, injected, absorbed, and in some cases abused through daily living. Substances such as alcohol, drugs, caffeine, sugar, smoke, pesticides, parasites, and harsh chemicals may come to mind. Although physical improvements often occur, emotional detoxes have little to do with the physical and everything to do with you as a spiritual being. Emotional detoxes are a systematic and mindful practice for purifying undigested and overprocessed emotions, freeing us from the illusion that we are separate from love. They return us to our natural state of joy. Like overprocessed and undigested foods that deplete energy (e.g., Tic Tac mints, which I happen to love), our emotions are so overprocessed by thinking they become unnatural. We know when this happens—when our feelings are weird, foreign, or unappealing. Just as consuming sugar substitutes can trick our body into being hungrier, living in emotional reactivity tricks our body. We get a temporary and illusory feeling of being okay, but it doesn’t last. This is because reactive emotions don’t nourish us. One might think the point of an emotional detox is to get rid of it all—hurt, pain, guilt, sadness, and stress—because when left unresolved these emotions can make us sick, but this is not the case. We need to properly process our emotions. Since our bodies are connected to our spirits, they don’t benefit from all these toxins; what we thrive on is love. Learning how to process emotions through a detox will bring you closer to love. To get rid of a feeling would be a reaction, like saying, “I am so done with him.” After I learned of my husband’s affair, part of me would have given anything to get rid of my pain, to make my husband pay for his mistake, or to confront the stranger who contributed to his actions. Something inside of me—it may have been my higher self—told me that to react from anger would only do more harm. I believed there were great lessons to be learned if I trusted all would be cleared through an emotional detox. I was right. Here is the thing: our emotions have value no matter how painful and upsetting they may be. Undermining, numbing, or pushing them away will only delay their benefits. Rather than a juice cleanse where you might flush out highly acidic foods and sugar, think of an emotional detox as a reaction cleanse, where you flush out high levels of stress, worry, and defensiveness. The same was true for me, which was why I turned to an emotional detox. It wasn’t until I was with things as they were that I was able to experience life in a new way. Whether you are moving through a traumatic experience, looking to release the past, or just want to create more positive experiences in your life, emotional detoxes will help. If you find yourself trying to fix everyone else’s problems, feeling guilty for saying no, or becoming less engaged with the people around you, then you will receive help from a detox. If you take more time for others than you do for yourself or have experienced trauma, a detox is in order. If you are a thinker, dwell on life’s problems, or are finding it hard to be in the present moment, an emotional detox is something to consider. · Feeling like you work hard but nothing changes. · Interested in learning how to be more present and mindful. One of the greatest things you will learn from an emotional detox is how to digest your feelings both verbally and nonverbally. You will see how there is more to emotions than expressing them. Without awareness, talking about our feelings can be a form of reactivity. If you have ever listened to someone rant about their problems, you know what I mean. Let’s say you listen to a mom at the playground vent about her lack of sleep. If you are a parent yourself, you’ll probably relate to the feeling. Before you know it, you are in a discussion about sleep deprivation. Later you find yourself discussing this person’s problems with someone else, because part of you feels guilty for not being able to physically help this mom out. That’s a way of relating rather than digesting feelings. our ability to empathize with others without moving into reactivity improves. Toxicity and Energize Joy by Sherianna Boyle, Med, CAGS. permission of the publisher. All rights reserved. 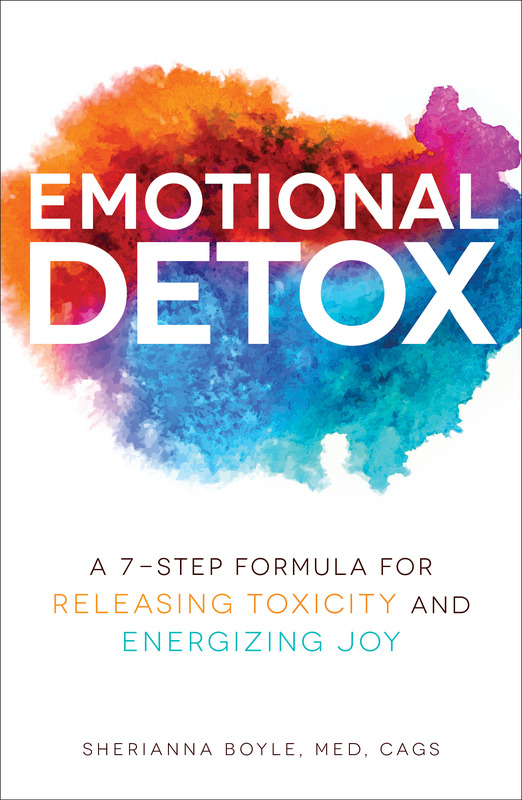 Sherianna Boyle, MEd CAGS is the author of the forthcoming book Emotional Detox: 7 Steps to Release Toxicity and Energize Joy (May 2018, Adams Media, a division of Simon & Schuster). She is an adjunct psychology professor, certified energy practitioner, yoga instructor, mother of three girls, and author of seven books; she has also been published in more than fifty articles. She is the author of The Four Gifts of Anxiety, Mantras Made Easy, The Conscious Parent’s Guide to Childhood Anxiety, Choosing Love, and The Everything Parent’s Guide to Overcoming Childhood Anxiety. Her transformative Emotional Detox program is also featured as part of the Kripalu Center for Yoga & Health’s workshop series. Her book The Four Gifts of Anxiety, was endorsed by NAMI. Sherianna’s resources and videos can be found at SheriannaBoyle.com.